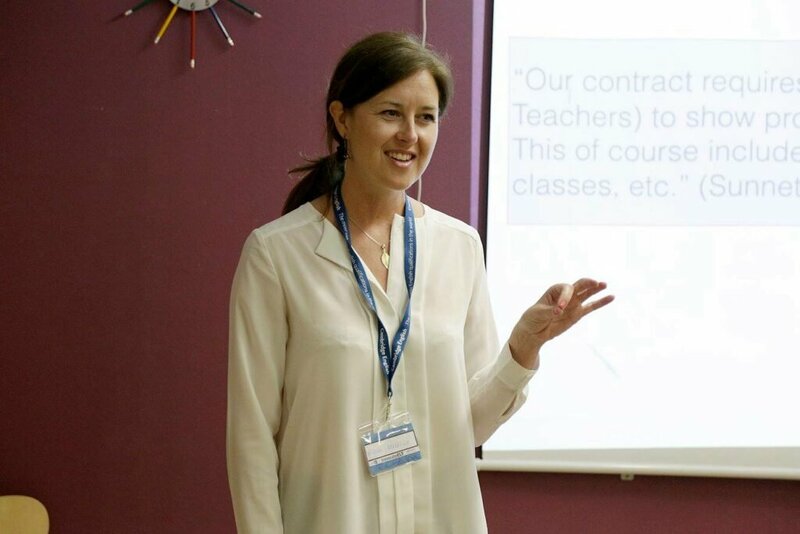 Nicola Meldrum is Course Director of Oxford TEFL’s Trinity DipTESOL course. She also designs online courses for teachers and learners and coaches ESP learners. As well as helping to organize local teacher development events, Nicola has delivered workshops all over the world on a variety of topics. She has also written a wide range of articles and teaching materials and is currently writing for the iTDi project. Here, she reflects on her presentation and experience at IATEFL 2016 in Birmingham, UK in April 2016. I have been interested in what role language learners have in teacher education for some time now. This started a few years ago when I was prompted to reflect on my role as a teacher trainer on Oxford TEFL’s Trinity CertTESOL course. I had heard trainers from a variety of institutions (ours included) giving learners names such as guinea pigs or practice students. I wondered why this was when we usually place learners at the centre of our teaching. They are our bread and butter and I think it is safe to say that most teachers and language learning providers strive to create learner centred classes and value their voice and opinion highly. I started to involve learners more in observed teaching practice and even did some research to explore how in line learners’ opinions of trainee teachers were with tutors on our certificate course. I presented the results at Iatefl in 2011. This year I returned to the issue but looking at a Diploma level teacher education course! I am course director on OxfordTEFL’s Trinity DipTESOL course. This involves lots of lesson observations. The teachers have to plan, deliver and reflect on lessons based on the learners’ needs. They are definitely at the heart of the process, but I started to see how they still did not really have a voice. We tended to do a needs analysis at the start of the course and then steam ahead planning and delivering lessons based on these initial findings without ever considering learner feedback in any in depth or constructive way. I decided to take action and get learners more involved. I started by recording a lesson with a colleague of mine. She taught and I observed and recorded it. We agreed that we would get feedback from the learners at key moments during the lesson and focus on some relevant teaching and learning points, such as how the pronunciation activities helped them, how they felt about the presentation and practice of lexis and how they feel about error correction. We felt this might provide us with some data we could use on future diploma courses- videos of learners talking about a lesson. It was a great success and we were both impressed by how well the learners could articulate their ideas. My colleague mentioned after the lesson that having me observe and intervene was really useful as I had time to think of good questions. She felt that while teaching she would not have come up with such insightful prompts. This led me to where I am now. I moved away from creating video resources and started intervening more to get live feedback during observed lessons. With trainees on our current course we have refined the process. I meet the teachers before the lesson and we discuss what they would like to ask the learners about. We look at the lesson plan and decide on the best moments to pause the lesson and get feedback and how we will record this feedback- video, learners interviewing each other and taking notes or using audio recordings on their smart phones. I then observe the lesson and think of useful questions to ask learners. I talk to the learners, write my questions on the board and the teacher and I monitor and listen to their comments. The teacher also adds any additional questions they have. It usually takes about 5-10 minutes. The teachers have found it incredibly useful. Here are some comments from them. It was really useful, as I said, we sometimes take for granted that what we learn from theory and common practice is what the learners actually want/need, it helps you reflect on the different stages of the lesson, their usefulness/effectiveness….. I presented these ideas and experiences at IATEFL this year. After the talk some of the audience questioned whether learners DO know best. Should we listen/ pander to their ideas- what if they are wrong? This is a fair point I think and that is why having this as part of a diploma course is so effective. It creates a triangle of input and reflection- the teacher trainer who is in theory an experienced expert. the learner, whose needs we are taking into account and valuing and the trainee teacher who is reading a lot of theory, getting trainers’ feedback and now comparing this with what their learners have to say. The expert trainer is there to mediate all this and help the trainee teacher reflect on it. This can only help them to question and strengthen their beliefs about teaching and learning. That is what the diploma is all about; developing teachers to explore and confirm their beliefs so they can become better teachers. They are also our future trainers and another bonus of doing this kind of intervention in lesson observations is it adds another dimension to the trainers’ roles. We all copy models we are given in our education, so as trainers we need to be aware of this and demonstrate a range of methods and roles to our developing teachers. I recommend you try this out if you are involved in teacher education. If you are interested please get in touch! If you are interested in developing your teaching skills take a look at our online, blended and face to face teacher development courses or contact us for more information.